This is by no means authentic, though the ingredients are inspired by tagines I have eaten in the past - more from Moroccan and Lebanese restaurants in London than its North African counterpart, which I sampled towards the end of last year on a short holiday to Marrakech. And not least inauthentic because I don't think authentic tagines have red wine in them! Hopefully, what this lacks in authenticity, it makes up for in flavour. It's certainly one of my favourite recipes, and one I've been meaning to blog for a while. The orange juice, apricots and honey add a delicate sweetness to the earthy spices, flavour-filled potatoes and deliciously tender chicken. This is similarly good when made purely vegetarian (just omit the chicken), and I'm sure it would work equally well when made with with lamb for those that eat it - if you do try any variations on this, do let me know. I'd love to hear how it turned out for you. Pour 1 tbsp olive oil into a heavy-bottomed casserole dish, then peel and cut the onions into wedges. Turn on the heat, and add the onions and spices to the pan then cover. Peel and chop the garlic cloves in half, then add to the pan. Next add the potatoes, chopping any particularly large ones in half or into thirds, then peel and cut the carrots into batons before adding to the vegetables. Cut the courgettes in half lengthways, then into 1cm diagonal slices, then leave to gently fry with the other vegetables until the onions have turned translucent. Cut the chicken thighs into 2.5cm strips and fry for a couple of minutes with the vegetables, then add the orange juice, red wine, honey, dried apricots and chopped tomatoes. Add a pinch of salt and pepper to the tagine and simmer gently for up to an hour. You may wish to taste for seasoning: I tend to keep the tagine itself quite plain with the expectation that I will drizzle plenty of harissa over it when served; so if you know both you and everyone else what will be eating it likes it spicy, do add a teaspoon of harissa to the mix as it cooks. As with all casserole-type dishes, the flavour of the tagine improves on a second cooking, so I try to make it in advance, reheating until gently bubbling when I'm ready to eat. About 10 minutes before you're due to serve, roughly chop 25g of fresh coriander and stir into the tagine. Reserve a little of the coriander for garnish. Serve with cous cous or rice, and lots of lovely harissa drizzled on top. 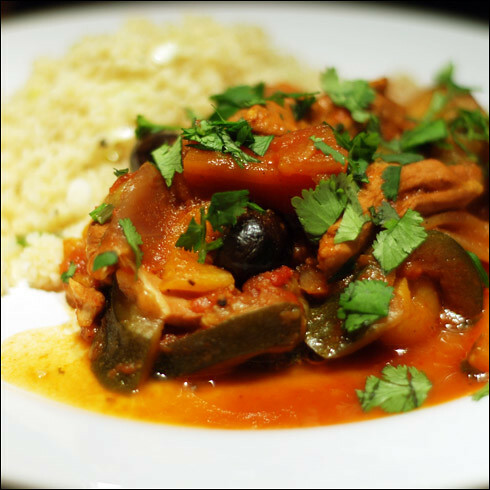 Mmm, tagines always look so so good. I think it's a great way of cooking!